Now, this is not the most upbeat quote that you could pick out. And Stoner is not itself a novel that is filled with humor or anything terribly upbeat. But there is a truthfulness to it, a kind of simplicty and an inevitablity that you can’t argue with and that you have to eventually account for. I am always going to associate Stoner, oddly enough with sensations of summertime. One of the reasons I am going to do this is because I read the book during the high heat of this past June. I read it sweating on the Union Square 4,5,6 platform; I read it with an aggravating headache at the Lorimer L stop; I read it drinking water and coffee simultaneously on the rooftop out of my kitchen window on luxurious summer Fridays; I read it in my bed, sweating again, but listening to the whirr of my fan and the whish of cars along the road outside. Stoner as a novel is more than just summer. Its pages actually remind one more of the end of summer, the kind of weather we have refreshingly felt this past week along the avenues of the city and I’m sure elsewhere. That thrilling morning chill when the sun is still very bright and you know that the heat of the day is simply lurking in the shadows of the homes and buildings that surround you, possibly in the grass and the dirt and will reveal itself in the stretch of the afternoon until it finally disappears into the cool and dew of the night – that time when you pull out a sweater or sweatshirt and wear it on your bare chest, perspiring only lightly. Stoner does all seasons. But the concern here, the concern with summer is that Stoner offers such a view of detachment from one’s life that it seems so out of step with the things we feel in the summertime. Usually, summer is a time for getting grass stains on your shirts. Letting those dripping ice cream streaks run down and plummet to the knitted tops of your socks; running blackfooted on grass and pavement; allowing the sweat to stick to your skin and the smell of dirt to linger on your fingertips and fingernails. Sand and salt live in our hair in this vision of a popularized summer. Stoner on the other hand is a tale of a man who finds his life being lived for him as he goes along. Sure he participates in a marriage, a career, an affair that could be called love, and a passion for literature that he supposes rings true, but in the end he is left grasping at what has been truly palpable in his life. That is not what we want to think about in summer. In summer we want to think about staying up all night; we want to think about swimming in the ocean; we want to think about love and drinking coffee early in the morning and surprising ourselves at how good that can feel when everying this quiet and hot. So how can Stoner help us in the summer? Well, it can give us memories of reading its direct and poetic prose for starters. However, it can also cause us to remember to take hold of our lives at every moment. A passion may be stirring in your gut and you may be told by someone who is older and presumably wiser than you what that exact fire is supposed to be, but you don’t necessarily have to listen. You can decide what the definition of your own passion is. You may be intrigued by a quiet, charming girl at a party and you may want to make her your wife. And perhaps you do. And perhaps you try at that marriage and it doesn’t work, even though you have a child. That doesn’t mean you have to listen to that institution of marriage and remain within its walls. You don’t have to let life define you. You don’t have to give in to a career when true love is calling to you. You don’t have to turn your back. Maybe I missed the point of the novel and maybe things like a career, the institutions of live, and the advice of older people are all vital and important. 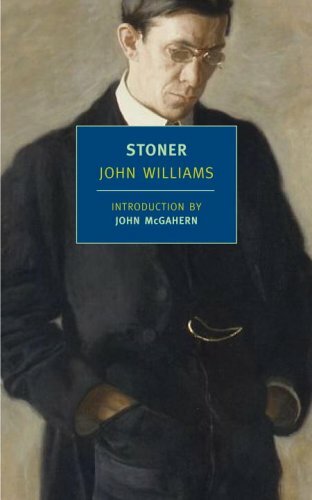 But why I want to dwell on this, is because William Stoner is the second character that I have encountered in fiction that so attracted me due to the sort of disconnect that was so apparent in that character. The first was Jack Burden from All The King’s Men by Robert Penn Warren. Jack Burden’s world was vastly different than William Stoner’s. Jack Burden was involved in the political game of 1930’s Louisiana. Jack Burden knew humidity and heat, he knew how to dig in the dirt – he knew how to find the kind of things that stuck to people. Jack Burden helped Willie Stark become the governor of Louisiana and he was good at digging up dirt and making it stick, yet he did it with such a detachment, with a wave of the hand that said “that’s just the way life is” that I was always so intrigued. It made the posture of sticking your hands in your pockets seem like a defense mechanism against all that was complicated and band in the world – because with your hands in your pockets, you could just walk away from Pandora’s box, you could let it all fall to hell and not give a damn; only breaking a sweat if you pulled your one hand out to grasp a flask of whiskey in the humid Louisiana night. Jack Burden wanted to care about things, which William Stoner very well wanted to do as well. Perhaps the first person narration helped Jack Burden’s case a little bit more. For in the end of All The King’s Men, after everything has come down, Jack Burden understands how to return to his life. He has recaptured what is important to him, something that he had forgotten a long time ago, or perhaps never even truly known, and made it palpable. He is able to pursue it. And, as he so famously does, he becomes one with the mist with Anne Stanton amid the pines in Burdenville. All The King’s Men reeks of summer and it always will. The heat of the highway is captured as perfectly as it has ever been captured in that novel. And you will get no better feelings of nightime in the summer than when Robert Penn Warren describes driving on the road at night and soon images of a spiderweb and the inevitability of actions in life come to the page and you start thinking about those late nights that you drove in the summer, smelling woodsmoke after a western rain, or in the orange light of sand lined streets, or away from the fair where the merry-go-round and ferris wheel lights blinked and spun as if they could tell you something you felt you already knew.